NextWhy don’t we say what we mean? Graduates of UC Santa Cruz’s Farm & Garden apprenticeship program have been planting the seeds of organic farming all over the nation and the world by starting their own endeavors—here are a few of them. Organic farming sounds so simple and easy. Plant a seed and watch it grow. Add water and plenty of sunlight. How hard could that be? Plenty hard, as it turns out. Today’s eco-conscious and community-minded farmers face daunting challenges. For starters, how can they grow great-tasting, nutritious food without harmful pesticides? How can they inspire other farmers to take up the challenge? How will they use their expertise to benefit others? It isn’t easy, but graduates of UC Santa Cruz’s Center for Agroecology and Sustainable Food Systems—also known as the Farm and Garden—apprenticeship program are up to the task. That’s why there are so many innovative growers out there, living out their farming dreams and exporting the principles of CASFS to consumers all over the nation. “UC Santa Cruz has always tried to make our apprentices and students feel honored, celebrated, and righteous for what they were learning and how they would move out into the world,” says CASFS executive director Daniel Press, the Olga T. Griswold Professor of Environmental Studies at UC Santa Cruz. 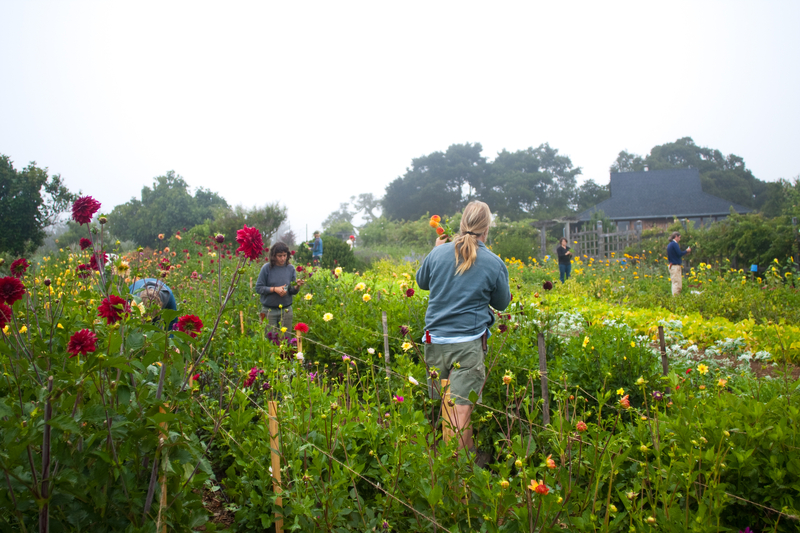 The number of thriving farms run by Farm & Garden apprenticeship alumni can be attributed to “the quality of the instructors, the peer support within each year’s apprenticeship cohort, and the beauty of the setting at UC Santa Cruz,” combined with one-on-one immersive training, said Martha Brown, senior editor at CASFS. Here is a brief sampling of farmers that have been making their mark. Aside from its tasty products, the farm is known for its strong relationships with community members, as well as its combination of for-profit farm and nonprofit educational program. Caleb Barron, a 2007 CASFS apprenticeship graduate, is co-owner of Fogline Farm, a small but thriving operation in the Santa Cruz Mountains, offering organic produce as well as pasture-raised hogs and farm-fresh eggs. Established in 2009, the farm offers CSA (community-supported agriculture) shares. All animals chow down on organic feed. Fogline is rich in local history, occupying a plot of land that has been cultivated since 1905. In 2016, Fogline Farm leased 10 acres from Rodini Farms. This beautiful rach, with lovely views of the golden hills that form the Central Coast, is just three miles north of Santa Cruz. At this ranch, Fogline gives its certified organic, pasture-raised broilers more pasture to move around on, and a moderate coastal climate. Matthew Raiford (2011 apprentice) is a true “CheFarmer”—part chef, part farmer, all organic food proponents. The food impresario runs Gilliard Farms, which has an astounding lineage; he and his sister, Althea, farm on land inherited from their great grandmother, Florine. 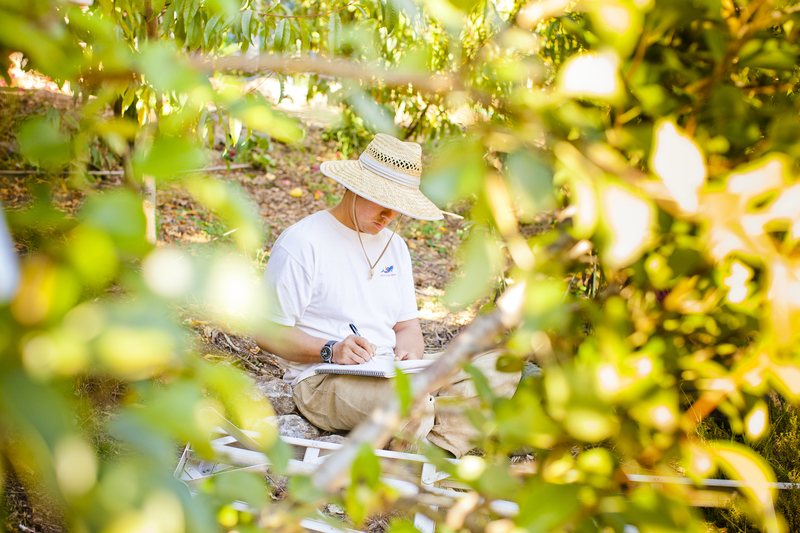 “I think farming was ingrained in me from a very early age,” said Raiford, who also holds a certificate in Ecological Horticulture from UC Santa Cruz. Raiford combines cutting-edge practice with age-old traditions. With obvious pride, his website points out that the farm was “first established in 1874.” The farm meets the criteria for organic, but the farmers on this land have never used chemicals to grow crops. In recognition of his achievements as well as his military service, CASFS offers a Matthew Raiford Scholarship for Veterans and accepts donations for the fund online. That’s because farm owner Joe Schirmer, a 1995 apprenticeship graduate, and the impresario behind Dirty Girl, takes his craft seriously. He grows 35 kinds of fruits and vegetables at this 32-acre expanse, which he purchased in 1999. Schirmer, who learned his craft at CASFS, later honed his skills by working on several farms throughout the West Coast. He started working at Dirty Girl in 1997, two years before he became the owner. While Dirty Girl tomatoes are famous in their own right, customers should not overlook other offerings such as arrowhead and savoy cabbage, cranberry and cannellini beans, cilantro, and leeks. In 2002, Nancy Vail (a 1997 apprenticeship graduate) and Jered Lawson (a 1994 apprenticeship graduate) gained access to a beautiful, triangle-shaped 14-acre property that now houses Pie Ranch on the San Mateo Coast. Fifteen years later, Pie Ranch now operates on 100-acres of land serving thousands of people each year through their educational programs and varied direct-marketing programs. The unique shape of the land is only part of the reason for Pie Ranch’s distinctive, impossible-to-forget name. The name also signifies “Pie in the Sky” values and idealistic thinking, with a focus on food system education and social justice. On top of all that, the owners believe that neighborhoods should all get their “slice of the pie” in terms of access to healthy food, education, land, and markets. And it almost goes without saying that—you guessed it—pie is available at the ranch’s farmstand seven days a week on Highway 1, near Pescadero. Pie Ranch has developed an integrated crop and livestock production system and grows a variety of produce from heritage wheat varieties, to heirloom tomatoes, dry beans, potatoes, lettuce and strawberries. The ranch also offers tours, barn dances and classes. Molly Rockamann (2005 Apprenticeship graduate) has been hard at work, bringing her brand of farming expertise to Missouri. EarthDance Farms, in Ferguson, outside St. Louis, is a training ground for future sustainable farmers. In fact, Rockamann was so inspired by her experience as a CASFS apprentice at UC Santa Cruz that she created a part-time apprenticeship program of her own, specially designed for people who live in the St. Louis area. In 2009 EarthDance inaugurated the part-time training program for 12 beginner farmers. In its second growing season—2010—it expanded the program with 31 apprentices and almost doubled the acreage, allowing it to raise more local, organic food and farmers for the St. Louis region. In 2011, EarthDance expanded its acreage and offered public CSA shares for the first time. Part farm, part youth-empowerment center, FoodWhat?! is a truly unique nonprofit operation, based in two locations: on a small parcel of land at the UC Santa Cruz Farm, and at another parcel at Farm Discovery at Live Earth Farm on Green Valley Road in Watsonville. The founder, Doron Comerchero (2004 and ’05), uses sustainable food and farming as a way to empower struggling and low-income youth in Santa Cruz County. For the past decade, Comerchero and his staff have worked hard to provide them with healthy food, meaningful work, and a supportive community. Most of the food is cooked and consumed on the spot, but participants also take home shares to their families. In various ways, the farm operations help the young growers find their inner strength. “This gives them a place to heal from past traumas, to see that they are not their past experiences, to explore their identities that many have not had the space to do so at home,” said Comerchero.